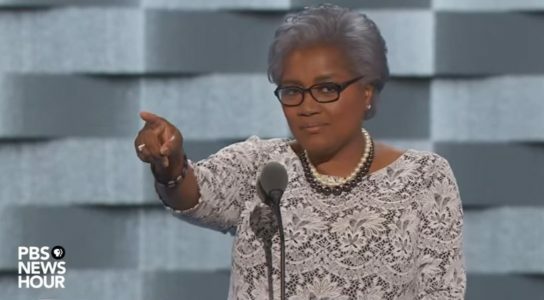 The Big Three networks, ABC, CBS and NBC ignored claims by former Democratic National Chairwoman and Clinton supporter Donna Brazile that the organization rigged the 2016 Democratic primary in Clinton’s favor. In an excerpt of her new book, “Hacks: The Inside Story of the Break-ins and Breakdowns That Put Donald Trump in the White House,” published by Politico early Thursday morning, Brazile admitted that Clinton’s campaign had arranged to help the committee erase its massive debt from the 2012 presidential campaign in return for significant control over its finances, months before she became the official nominee, thereby allowing her campaign to rig the primary to defeat Bernie Sanders. This type of revelation should be big news considering the controversy that Clinton has stirred up since the election last year, but for the major networks it didn’t merit one single mention on their evening broadcasts. CNN and Fox News did cover the story. What did the networks cover last night? GOP tax cuts, Paul Manafort, Niger, the new York City terror attack, travel site Tripadvisor’s deletion of negative reviews of a Mexican hotel by women who were sexually assaulted and Houston Astros outfielder Carlos Correa’s proposal to his girlfriend. Even the appearance of liberal favorite Sen. Elizabeth Warren (D,Ma) on CNN in the late afternoon discussing the scandal wasn’t enough for the networks to take notice.